graduation | Eat. Read. Ask. Do. Be. I spent 10 days in Texas this May, which were glorious in many ways, but specifically in the family and the food. Since nobody wants to hear me get all mushy over my family, I’ll focus on the food! I enjoyed several delicious meals during this trip, but I’ve selected three to share with you today. The first is of my very favorite restaurant in the world and a common favorite amongst Austinites: Magnolia Cafe. Mottos include: “Everyone Knows, Everyone Goes” and “Sorry, We’re Open” (they’re open 24/7). 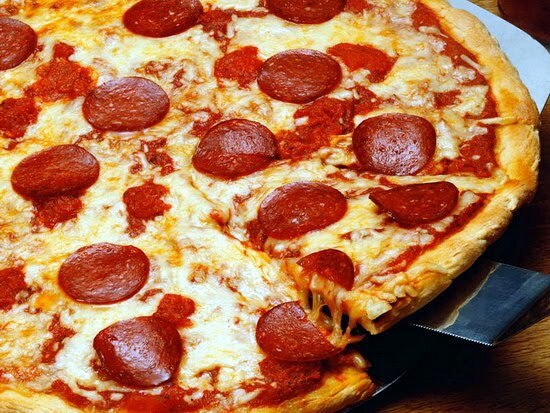 Ever wonder what your dying meal would be? I don’t. It’s this. Queso with black beans, pico and avocado: “Mag Mud” — We’re married. Every meal I have here begins with their house favorite: Mag Mud. 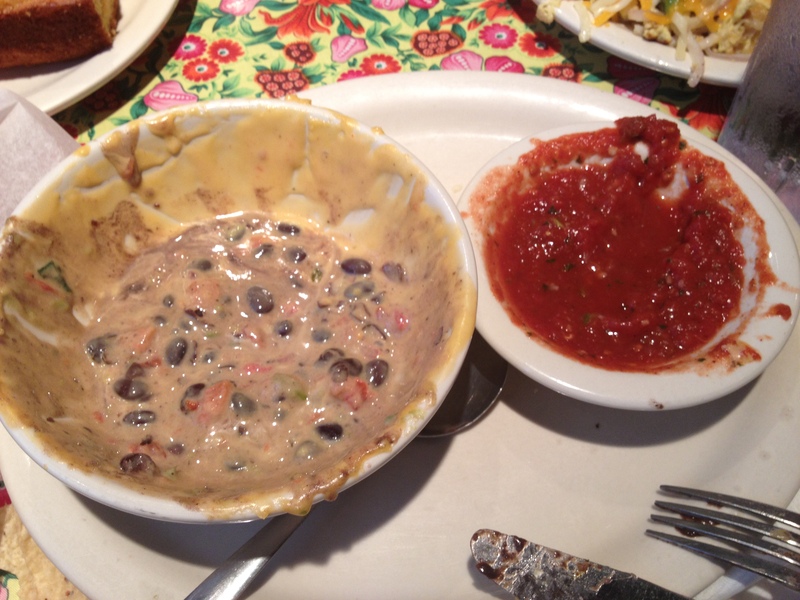 This consists of chili con queso, a Tex-Mex staple, along with black beans, pico de gallo and avocado. It’s quite simply the most delicious thing I’ve ever had anywhere. 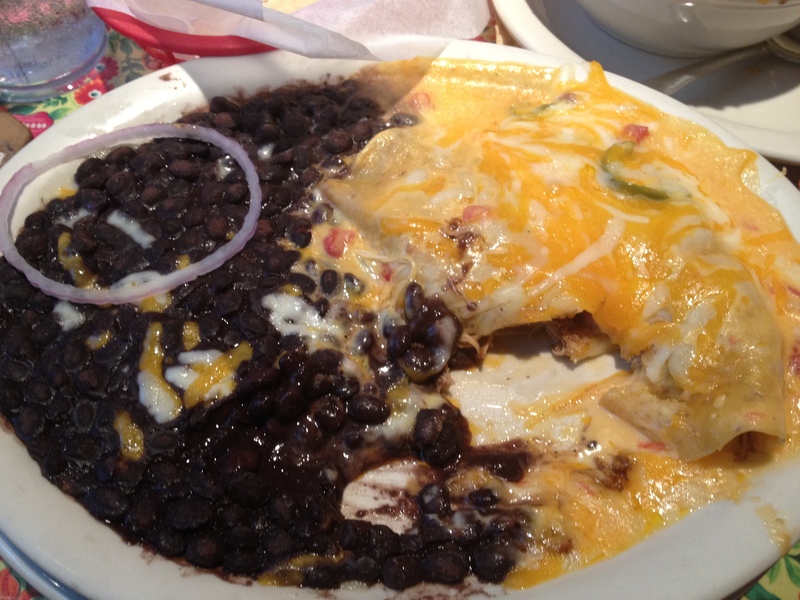 I generally continue my meal with the chicken enchiladas and I double up on the black beans cause, as I’ve mentioned before, I don’t care for rice. I’ve had enchiladas all over the country, although having them all over Texas is enough to establish my credibility when I say these are the best. THE BEST. … and a Shiner Bock! My trip continued from Austin to Abilene to see my sister, Kate, graduate from college. I enjoyed this drive with my grandma and best friend, Velma Rae. On our first night in Abilene, Kate wanted to show off her town a little, which began with a beautiful meal at the downtown steakhouse: The Beehive Saloon. 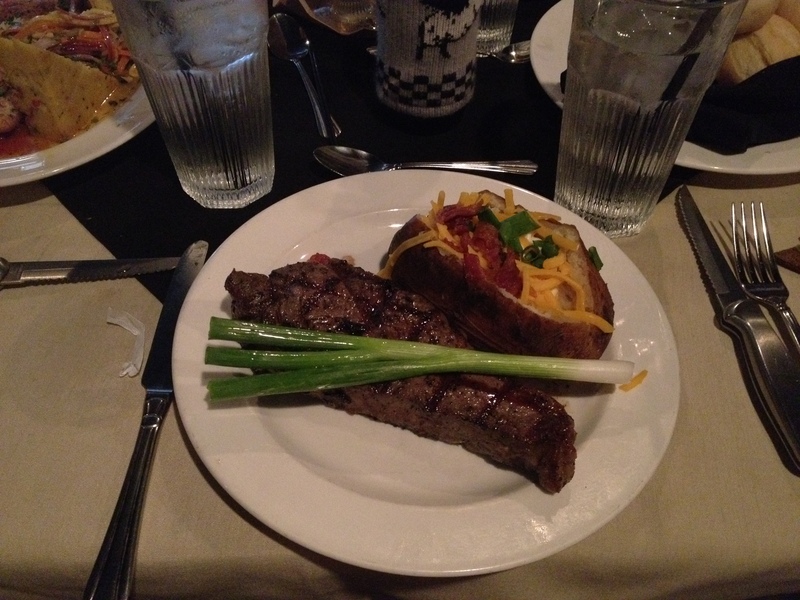 Here I enjoyed a deliciously tender strip steak with a loaded baked potato: the food of my ancestors. 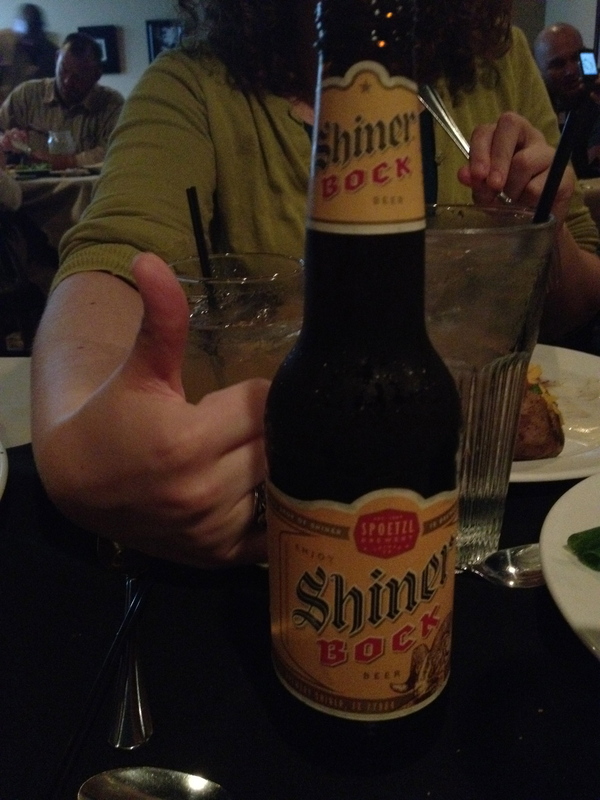 And, of course, no Texas trip is complete with a Shiner Bock. 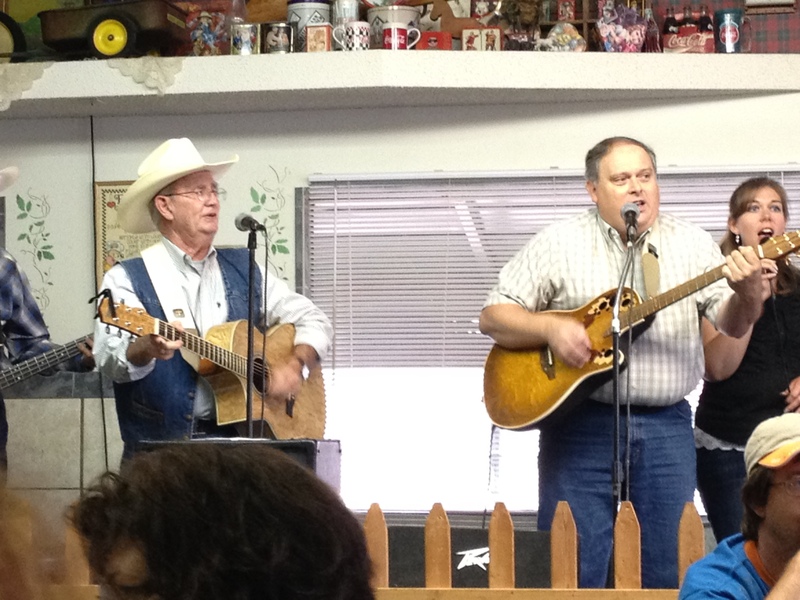 An old-school country-style gospel band entertained us! I did not take this photo, I was too hungry — Click to read the blog I borrowed it from. My life and my love are in New York, but my heart remains in Texas. We will be reunited some day.